Found 2 file extension associations related to V+ Visual Programming Environment and 2 file formats developed specifically for use with V+ Visual Programming Environment. 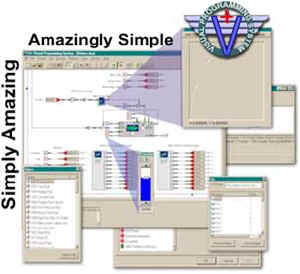 Developer / company: SimPhonics, Inc.
V+ is a worlds' first: a true Visual Programming Language that dramatically simplifies system integration and programming tasks. From simple math to complete subsystems, V+ is a proven paradigm. It now powers all SimPhonics system products, from audio subsystems to complete simulator interfaces such as the ISED (a complete I/O, audio, intercom, sound and DIS radio system). V+ is rapidly gaining wide acceptance, and is in use in commercial and military systems around the world. If you need more information please contact the developers of V+ Visual Programming Environment (SimPhonics, Inc.), or check out their product website.